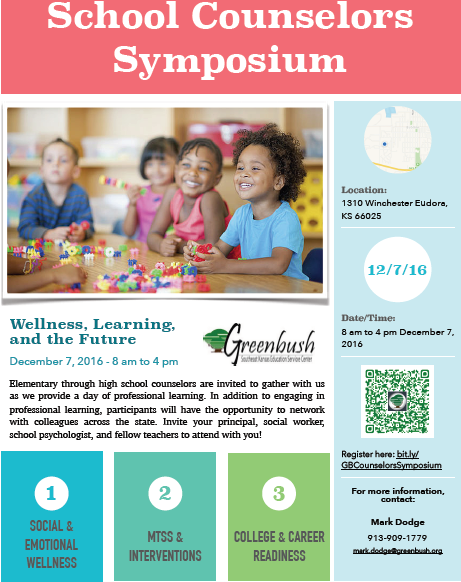 This December, Greenbush will be hosting a School Counselor's Symposium designed to provide professional learning for school counselors, PreK-12. The event will take place in Eudora from 8 am to 4 pm, on Wednesday, December 7. Their focus will be centered around 1) Social Emotional Wellness, 2) MTSS and Interventions, and 3) College and Career Readiness. While the title specifies school counselors, Greenbush asked that we share this event with school psychologists as well because the event will be very relevant to our work.. If you are interested in attending, you can register at bit.ly/GBCounselorsSymposium. This event is not sanctioned by KASP. It is provided here as a way to inform our members of area events. If you have any event you would like KASP to share, please email kaspempowers@gmail.com.